Diamond paste ready-packed for dispensing in syringes which are color-coded. Graded sizes and compounded for good dispersion. Exceeds US standards for purity, size and uniformity. Excellent cutting rates and provides a good smooth finish. Recommended for polishing various metals, alloys, minerals, glass, ceramics, carbides, semiconductors. Water and oil soluable. Available in 5 and 18 gram syringes and as 250 milliliter pump spray. 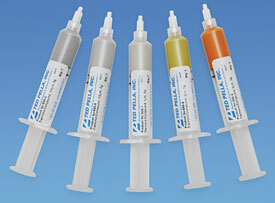 Set includes 5 sizes (5g syringes or 250ml pump sprays) each: 0.25µm, 0.5µm, 1µm, 3µm and 6µm. The diamond extender fluid is used to dilute the diamond paste on polishing cloths to ensure even dispersion and more effective cutting action. Water-based, available in 1 pt. and 1 gal. The polycrystalline is typically used on hard to polish materials such as ceramics, tool steels, sapphire, and super alloys. It has more facets or cutting edges and keeps its cutting ability by being less friable (easily crumbled or pulverized) than the more common and less costly monocrystalline diamonds. Monocrystalline diamonds tend to have longer, sharper edges and are more suitable for less hard materials such as brass or soft steel. Polycrystalline diamond is somewhat spherical in shape and it has a greater number of cutting facets than monocrystalline diamond, therefore reducing subsurface deformation, giving more precise results when surfaces are etched.